Driven by strong values for the protection of the environment, Jinane, young Montalban, wishes to act! Accompanied by the Youth Moderator of the MJC, she organizes her first Clean Walk. A Clean Walk is a gathering of volunteers who share the will to act for their city and concretely reduce their impact on the environment. Together they equip themselves with gloves and garbage bags and pick up all the waste of an area, a neighborhood. Join Jinane and the volunteers on Saturday, April 20, 2019 at 3pm at the Eurythmie car park for a Citizen Clean Walk! 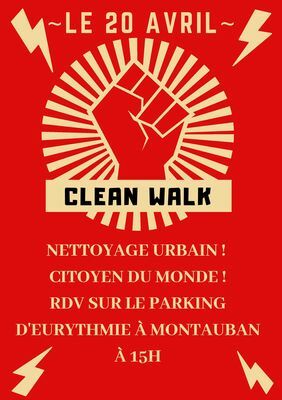 Put on a pair of reusable gloves (latex gloves will be available in case) and join them to clean the green flow, plant corridor in the heart of Montauban, walk space appreciated by all!